I'd heard of the Color, Materials and Trends Exploration Laboratory (CMTEL, site and catalogue currently under construction) at the Materials Library Special Interest Group at the ARLIS/VRA Conference in Minneapolis. Here is the power point from that session… if you'd like a look. Unfortunately, CMTEL Asscociate Director Marshall Hamaguchi was unavailable the day I could visit the Pasadena campus to meet with the ACCD's James Lemont Fogg Library staff. 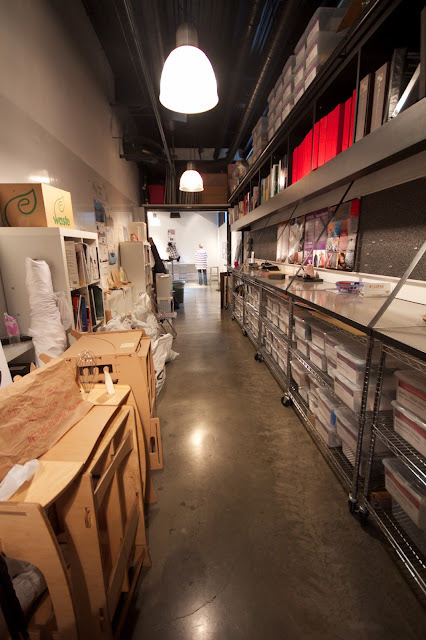 Luckily, Library Director Betsy Galloway had time to guide me through the bustling hustle of the Art Center halls and galleries (that were in full Grad show prep-mode) to give me a quick peek at the layout and scope of this fine materials library. 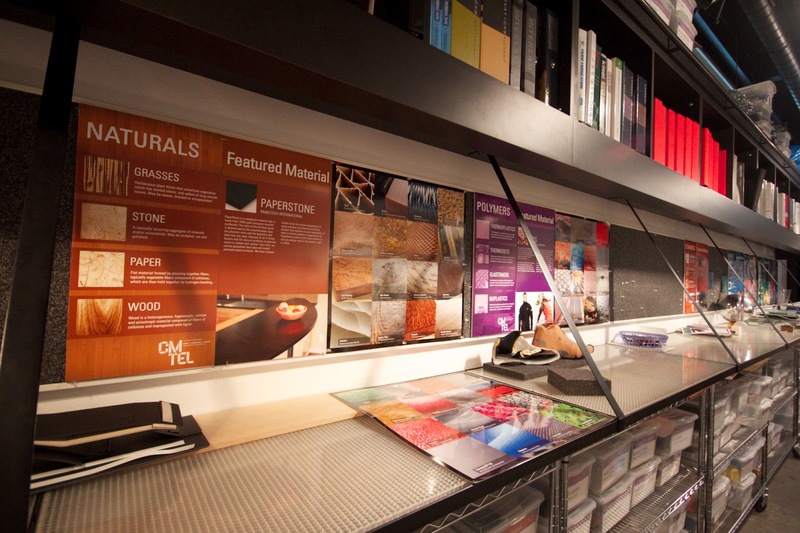 Founded by Karen Hofmann, Department Chair of Product Design and Director CMTEL, (who has developed materials labs for industry) the collection has a strong focus on sustainable materials and materials with unusual properties such as illumination, translucency and sonics. 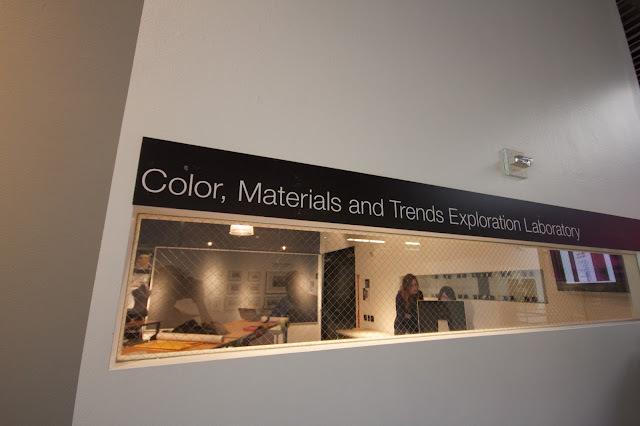 "In order to provide artists and designers with the resources to become better problem solvers, innovators, storytellers and leaders, Art Center has developed an innovative program to provide expanded resources and expertise in color and materials technologies, as well as understanding global trends. 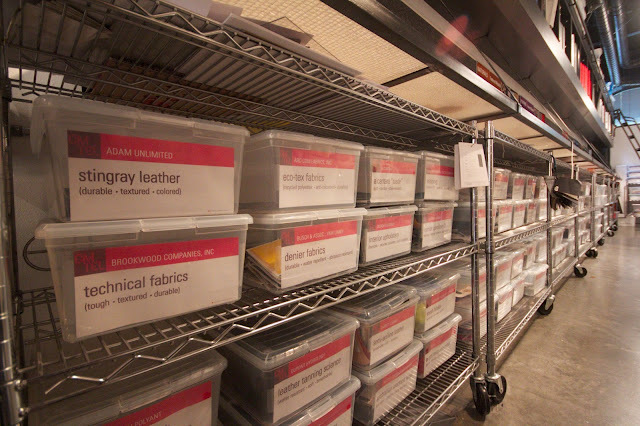 Supported by funding from Nokia and Avery Dennison, CMTEL hosts a variety of events, lectures and courses on topics such as sustainable design, trend forecasting, lighting technologies and more."